We’d love your help. 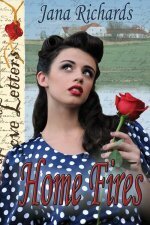 Let us know what’s wrong with this preview of Home Fires by Jana Richards. Anne Wakefield travels halfway around the world for love. But when she arrives in Canada from England at the end of World War II, she discovers the handsome Canadian pilot she’d fallen in love with has married someone else. Heartbroken, she prepares to return to London, though she has nothing left there to return to. Her former fiancé’s mother makes a suggestion: marriage Anne Wakefield travels halfway around the world for love. But when she arrives in Canada from England at the end of World War II, she discovers the handsome Canadian pilot she’d fallen in love with has married someone else. Heartbroken, she prepares to return to London, though she has nothing left there to return to. Her former fiancé’s mother makes a suggestion: marriage to her other son. Badly wounded and scarred during the war, Erik Gustafson thinks he’s a poor substitute for his brother. Although he loves Anne almost from the first time he sees her, he cannot believe she would ever be able to love him as he is – especially as he might be after another operation on his bad leg. To ask other readers questions about Home Fires, please sign up. I've always been fascinated by stories of the women who came over to America and Canada after the World Wars as war brides. I have really only read non-fiction stories about these women so I found this book interesting off the bat. I think it's just so fascinating that these women left everything that they knew behind for the promise of love and a perhaps a better life in the process. Tis a romantic idea, no? I felt really bad for Anne. She comes to Canada wanting to marry one brother, Anders, on I've always been fascinated by stories of the women who came over to America and Canada after the World Wars as war brides. I have really only read non-fiction stories about these women so I found this book interesting off the bat. I think it's just so fascinating that these women left everything that they knew behind for the promise of love and a perhaps a better life in the process. Tis a romantic idea, no? I felt really bad for Anne. She comes to Canada wanting to marry one brother, Anders, only to realize that he's already involved (deeply involved) with another woman. His family still takes her in. Even though Anne landed in a good place with people caring for her, you still have to feel for her. I was rooting for her throughout the book. This book is very short. Since I found the subject matter so fascinating, I found myself wishing in a lot of places wishing for there to be a little more detail. The part where Erik's mother let's Erik know about the family secret seemed a little too neat. I wanted to know more about how things were between her and her husband with regard to the big, huge family secret. It's not a bad sign when you want the book to be a little longer! This review has been hidden because it contains spoilers. To view it, click here. Sweet romance about a British nurse who travels to Canada post WW2 to marry a soldier she met in a hospital, only to discover he has married someone else. This is an interesting period piece that is well worth reading. There is sexual tension as well as a couple toasty love scenes, as well as the pain of betrayal, uncertainty about the future, and more problems common to the human condition. The story is very touching and well worth reading. And you'll get your HEA in the end! Give this book a shot Sweet romance about a British nurse who travels to Canada post WW2 to marry a soldier she met in a hospital, only to discover he has married someone else. Reviewed for Nerdy Dirty and Flirty Blog. A new WW II romance from Jana Richards is always a treat, and this one is no exception. Set in Jana’s home country of Canada, the story provides a nice look at life on a farm in the time period before and just after the war. Anne Wakefield, almost literally left at the altar, is a gutsy heroine. The German blitz of London didn’t stop her, and neither will this new and shocking turn of events. But she’s brought a secret with her, and that may be more difficult to plow past. Erik Gustafson, who should have been her brother-in-law, is solicitous of Anne’s welfare from the beginning, but it’s easy for the reader to know his concern will turn to love–and that he’ll deny his feelings, as much to protect his self-esteem as to make sure he doesn’t put Anne in an even more difficult position. Needless to say, the course of true love doesn’t run smooth, but it’s the rocks that make the story more interesting. One just knows it will be happily-ever-after for everyone…one just isn’t sure how the end result will come about. All in all, Home Fires is a fun, worthwhile read, whether or not one is drawn to the war era. A couple of shall we say ‘hot’ love scenes came as a surprise as the action moved gently along, but the reviewer survived with a minimum of blushes. Anne Wakefield, a nurse, sat in the Emerald train station waiting for her fiance' to arrive, but everyone had left leaving her the only one still waiting. She had come from England on the War Bride Train and since all of her family had been killed in a bomb blast of the family home all she had was a few friends left. Anders Gustafson had rentlessly pursued her,and even bought her nylons and chocolates. At his last sortie he proposed and having no ties, she agreed to marry him and come to the oth Anne Wakefield, a nurse, sat in the Emerald train station waiting for her fiance' to arrive, but everyone had left leaving her the only one still waiting. She had come from England on the War Bride Train and since all of her family had been killed in a bomb blast of the family home all she had was a few friends left. Anders Gustafson had rentlessly pursued her,and even bought her nylons and chocolates. At his last sortie he proposed and having no ties, she agreed to marry him and come to the other side of the ocean to marry him. Jana Richards has tried her hand at many writing projects over the years, from magazine articles and short stories to paranormal suspense and romantic comedy. She loves to create characters with a sense of humor, but also a serious side. She believes there's nothing more interesting then peeling back the layers of a character to see what makes them tick. When not writing up a storm, working at her Jana Richards has tried her hand at many writing projects over the years, from magazine articles and short stories to paranormal suspense and romantic comedy. She loves to create characters with a sense of humor, but also a serious side. She believes there's nothing more interesting then peeling back the layers of a character to see what makes them tick. Jana lives in Western Canada with her husband Warren, along with two university aged daughters and a highly spoiled Pug/Terrier cross named Lou.